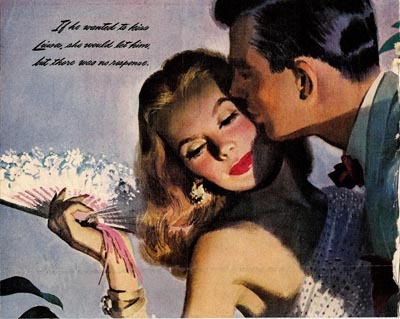 Today's Inspiration: Jon Whitcomb: "I don't think of myself as an artist. 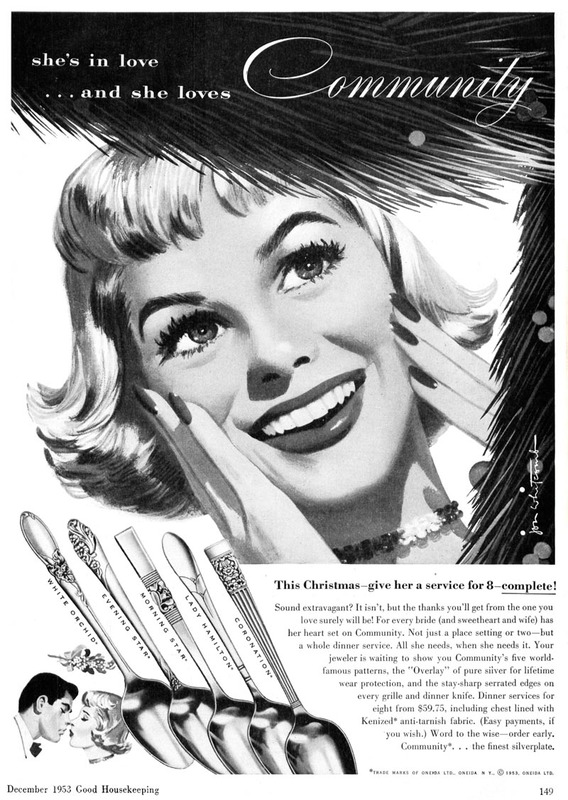 I'm a manufacturer"
Jon Whitcomb: "I don't think of myself as an artist. I'm a manufacturer"
"How do you want to be presented?" 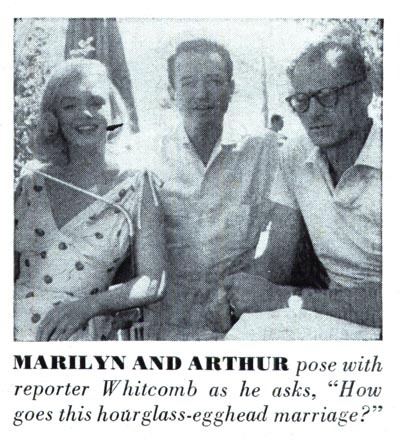 [Hatch] asked Whitcomb. "That is, how do you think of yourself in relation to your public and the students you will teach?" "You can say that I don't think of myself as an artist. I'm a manufacturer, supplying something editors want to buy. Somewhere I discovered what these people want and through a fortunate chain of circumstances I find myself able to produce it." Then he pursued his philosophy, which combines a purely practical approach with his own enthusiasm for innovation. "You've got to be something new every year," he said. "As long as I can, I'll keep a non-static quality. I don't want to be dated. . . ."
" . . . The self analysis required in preparing a course makes me terribly aware of my limitations," he told me. "On the other hand, I believe that the things that make artists interesting to a buyer are their shortcomings. Flaws plus virtue add up to character . . . ."
. . . in answer to my question as to ambition for the future. Very serious for once, he replied slowly. "I haven't a sturdy ego or a good opinion of my work. Often I hate my pictures five minutes after I've finished them. Some day I like to go to where I can do things to please me. I have no ambition to paint for future generations. All I want is to be good right now." In Al Parker's Advanced course, you can see how he delights in finding the novel idea, the fresh approach, the unexpected chord, just like the improvisational jazz he loved (and could play too). Parker said the hardest thing he had to do in his career was selecting which single idea out of ten or twenty he came up to settle on. I think of Parker like his musical namesake, Charlie Parker, one of the many jazz greats Parker's son remembers coming to Westport to jam with his dad. Dizzy Gillespie, another Be Bop revolutionary, said once you heard Bird play, as every musican of the era can recall, "you knew the music had to go his way." For Whitcomb, on the other hand, "innovation", "a non-static quality" meant something far different than Parker. "Something new" meant forecasting what would be in fashion or popular in six months. That's what gave him his motivation, his kick. He believed that movies and the press had determined what a pretty girl looked like and how to stage action. So you don't see much change in how he idealized his women (and when you look at his reference photographs and compare them with the illustrations, you can see that his women were elaborately constructed confections) or the endless tight close ups. 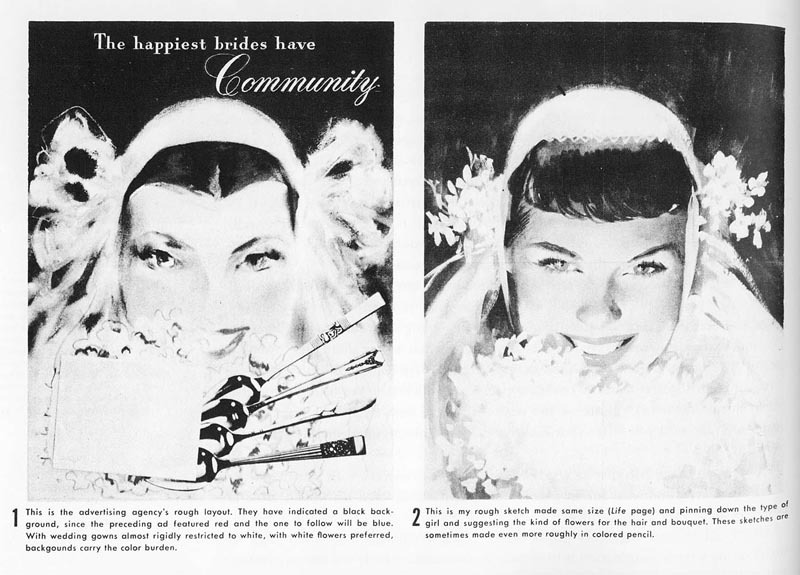 But in his commentary to his pictures, he points out again and again with pride how he correctly guessed hemlines were going to be longer or shorter the following season, how women were going to wear their hair, what accessories were necessary or would be left home, forgotten for good in a drawer. This is what preoccupied him. Every chapter somehow returns to this theme. A. Know what the public is beginning to like. B. Know what you are beginning to like. C. Know what you and public both like. D. Take C and imagine what you would like even more. E. Take a good guess as to the next development. Whitcomb cared about what he did and he worked hard, 12-16 hours a day. He did make an enormous amount of money and had a lavish lifestyle. (It's hard to remember illustrators were once the highest paid professionals in the country, surpassing even the movie industry. His home in Darien Connecticut was amazing. I wonder if it still exists.) But turning down a job wasn't for him. But it came with a price. 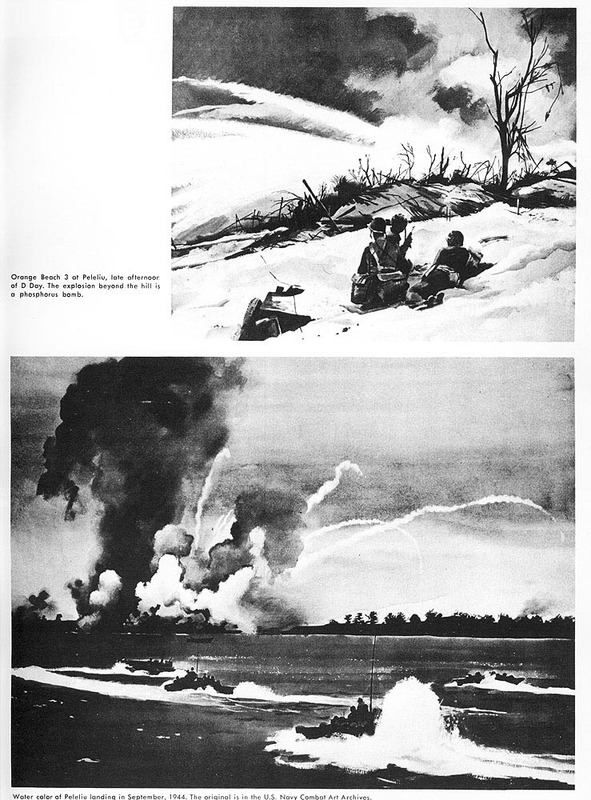 In his commentary, he often showed how his ideas were supressed or exaggerated by clients. He went on to explain that he was bored to death with sucess, with painting, with being a celebrity and with life in general. This attitude flavored his work and he is not seen these days in magazines. Almost all creative imagination grows out of not being bored. The whole trick to maintaining a fresh imagination is to remain curious about life. If you stay interested, you stay interesting." I imagine when Whitcomb no longer could trust his judgement "on what you and public both like" or maybe when he was no longer interested, he stopped, just like that. 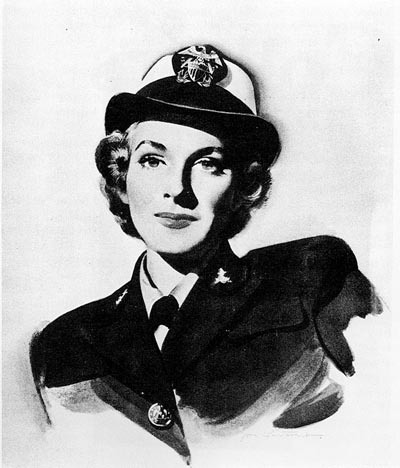 According to Fred Taraba's "Jon Whitcomb: The Spirit of Beauty" (Step By Step Jul/Aug 96), Whitcomb characterized his wartime service as a Navy lieutenant as "Nobody had a more miscellaneous war than I did," since he served in variously in minesweepers, did recruiting and factory production morale posters, and served as a combat artist in the Pacific Theater. 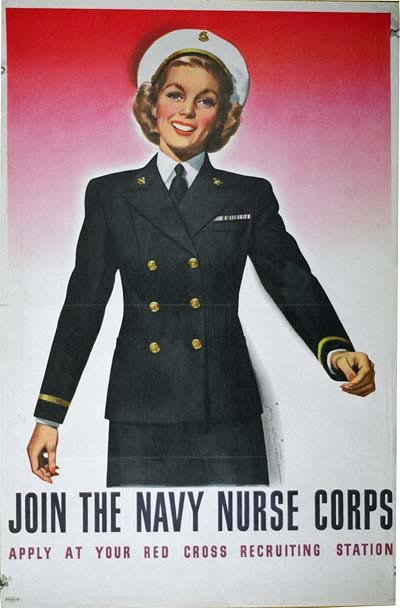 But Whitcomb also admitted his most effective contribution was the WAVE recruiting pictures which convinced young girls "if they joined the Navy, they would look like a Whitcomb picture." 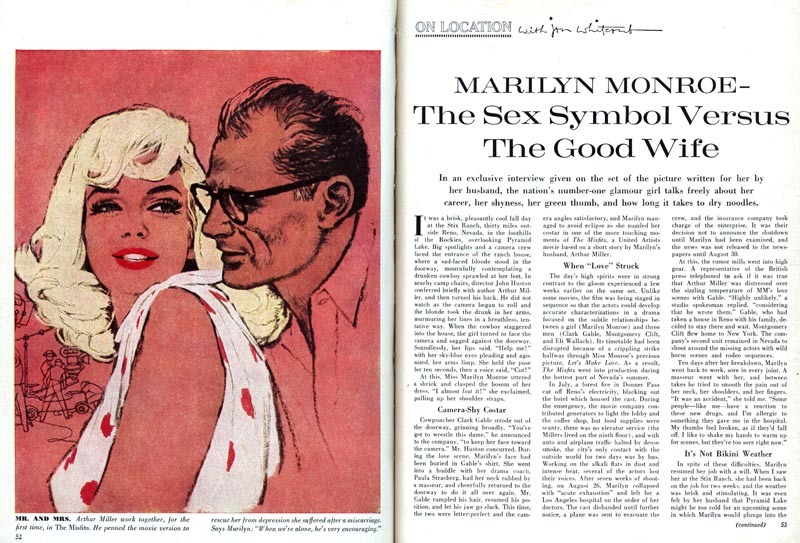 ...which accompanied his celebrity columns for Cosmopolitan and the society portraits he did after retiring from illustration. ...the reference photograph: although listed step 4, really might be his first step after he saw the agency layout--note how the spacing and arrangement between the hair and eyebrows, nose, and mouth are consistent through all the early examples. 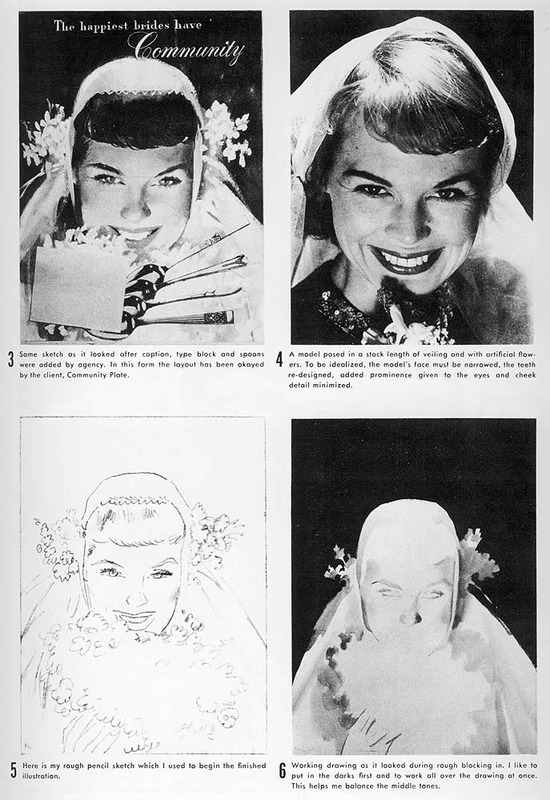 Whitcomb applied his usual idealization formulas, tracing the photo with a Balopticon (a large scale projector); the pencil sketch shows the asymmetry in the jaw and mouth that Whitcomb felt was always necessary to show real beauty in the flat POV of a magazine, "the reason why absolutely perfect faces occasionally encountered in real life fail to be entirely satisfying"--and that countless artists later copied. "About the time I put on long pants I developed an aversion for antiques. This particular prejudice extends to anything older than five or six minutes. I admire new hats, new actresses, new architecture, new plays, and new gadgets. Fate has played a trick on me . . ."
*Whew! * Many thanks to Armando Mendez for this exhaustive presentation on Jon Whitcomb. 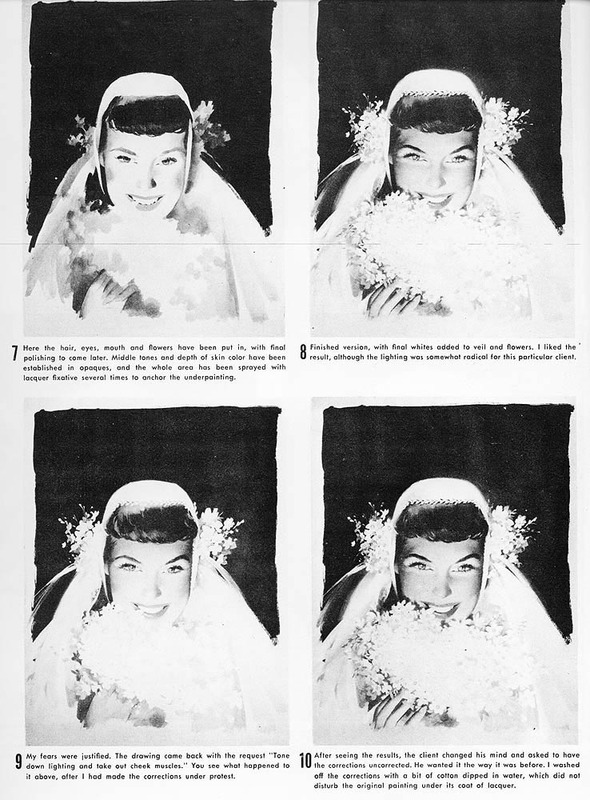 I'd say that if there was still any doubt about Whitcomb's motivations as a commercial artist they've been laid to rest. * Thanks also to Charlie Allen for providing some of today's images. 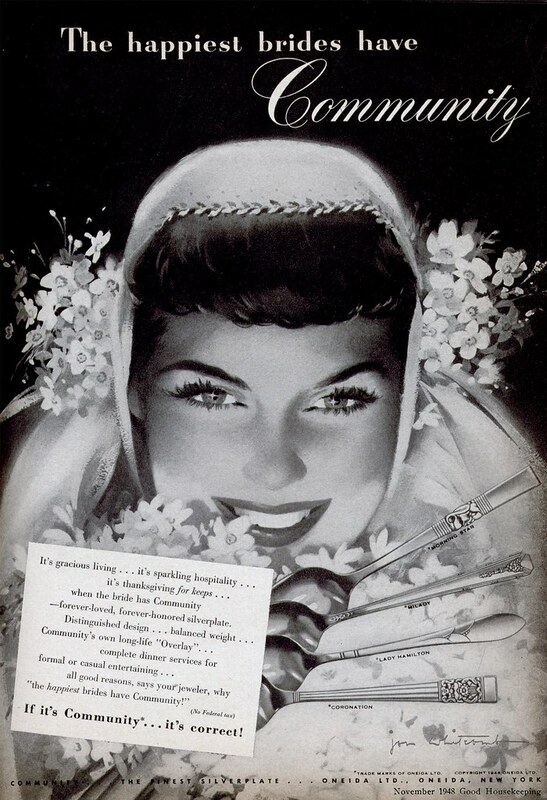 * My Jon Whitcomb Flickr set. Wonderful! Thanks Armando (and, as always to you Leif) for putting that together for us. 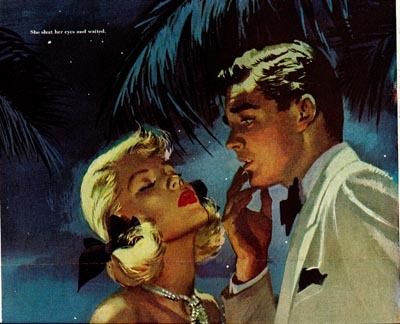 I think the evaluation of Jon Whitcomb's illustrations is somewhat like evaluating illustration versus fine art. Whitcomb focused on beauty, fashion and high style, while other illustrators were beginning to experiment with new and creative approaches, daring color schemes and innovative compositions. There were excellent fashion and glamour oriented illustrators like Carl (Eric) Erickson and John Lagatta in the 30's, but Whitcomb seemed to me to be the glamour king of the 50's. By the 60's, the Hollywood glamour and elegance of the past, was considered out dated and didn't apply to the new gathering storm of social changes ahead. Whitcomb may have loved anything new and modern, But, ironically his taste rapidly became antiquated in the eyes of a changing America. My very early art training embraced the idea of refinement, elegance and glamour, but by the time I started my illustration career, Whitcomb was nearly forgotten, and illustration was on it's way to a grittier more earthy look... bra less women with long hair, styled by the result of mere gravity, little or no makeup, and the young clean cut, fresh faced, handsome man no longer fit into the new unpolished look of the new generation. I guess you could say that in spite of Whitcomb”s desire to stay modern, he was a "one note Jonny" in a world of improvisation. I still admire and appreciate the illustrations depicting the beauty and glamour of those elegant women of the 30's, 40's and 50's illustrations. "If you stay interested, you stay interesting"
Good article and particularly thoughtful comment by Tom.